TUNIS, Tunisia -- Tunisia's Islamist party is denouncing a deadly attack on the country's presidential guard and urging Tunisians to unite behind the security forces as they hunt for the perpetrators. The Ennahda party said in a statement that "Tunisia is targeted because it is a democracy and represents a model of moderate Islam." No one has claimed responsibility for Tuesday's attack, though Tunisia has been hit by two big attacks by Islamic extremists this year. It called on all Tunisians to unite, saying "in these historic moments we should renew our trust in the security forces and army." The party won legislative elections after Tunisia's Arab Spring uprisings but struggled with violence and instability. It is no longer the governing party but remains a prominent political force. Meanwhile, Tunisia's president has declared a state of emergency throughout the country and a curfew in the capital after an attack on a bus carrying his presidential guard that killed 12 people. Beji Caid Essebsi said in a televised address that the country is at "war against terrorism" and called for international cooperation against extremists who have staged several attacks around the world in recent weeks. Essebsi said "I want to reassure the Tunisian people that we will vanquish terrorism." He wasn't in the bus when it was attacked Tuesday in the center of the capital. His office says he is cancelling a trip to Switzerland that had been scheduled for Wednesday. Tunisia's prime minister and interior minister are visiting the scene of a bus explosion that killed 12 and which the government is calling a "terrorist act." Prime Minister Habib Essid and Interior Minister Najem Gharsalli came quickly to the tree-lined avenue where the blast ripped through a bus carrying presidential guards. Police surrounded the area and erected security cordons, while ambulances evacuated the dead and wounded. Witness Bassem Trifi, a human rights lawyer, described "a catastrophic spectacle." He said the explosion hit the driver's side of the bus. "I saw at least five corpses on the ground," he told The Associated Press. "This was not an ordinary explosion." The Tunisian Interior Ministry says that an explosion that hit a bus carrying members of the presidential guard in the capital was a "terrorist act" that killed at least 12 people. Ministry spokesman Walid Louguini told The Associated Press that at least 16 people were wounded in Tuesday's attack. The blast came 10 days after authorities increased the security level in the capital and deployed security forces in unusually high numbers, and after the country's toiurism industry has been hit hard this year following extremist attacks. Tunisia's Interior Ministry says an explosion has struck a bus carrying members of the presidential guard in the country's capital, killing at least 11 people. The blast occurred on the tree-lined avenue in the center of the capital, Tunis. It was unclear what had caused the explosion, which came 10 days after authorities increased the security level in the capital and deployed security forces in unusually high numbers. Earlier this month, Tunisian authorities announced the dismantling of a cell it said had planned attacks at police stations and hotels in the seaside city of Sousse, about 150 kilometers (95 miles) southeast of Tunis. A luxury beach hotel in Sousse was hit by an attack last June that left 38 people dead. In March, an attack at Tunisia's famed Bardo museum near the capital killed 22 people. Tunisia's Interior Ministry says an explosion has struck a bus carrying the presidential guard on the main avenue in Tunis. A Tunisian national TV station Watanya says there were several victims in Tuesday's afternoon blast, but it was not immediately clear whether there were fatalities. 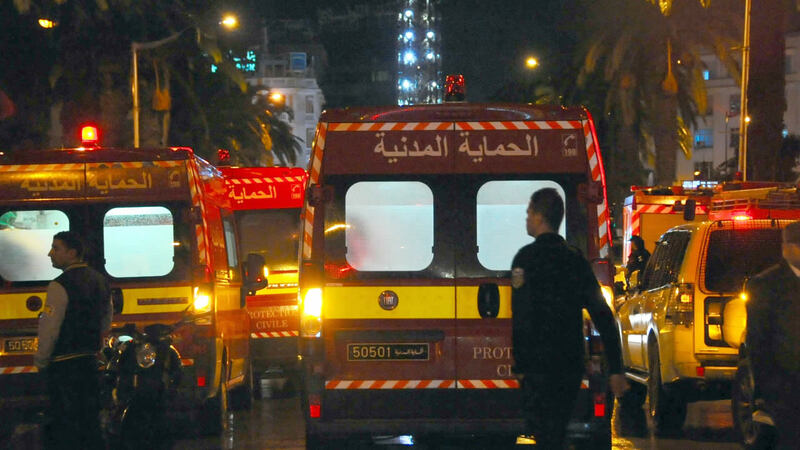 The blast occurred on the tree-lined avenue in the center of the capital, Tunis.